King Marong and Safara Music School offer a range or interactive workshops and courses suitable for schools and childcare centres, corporate and community events, festivals, private functions and parties. 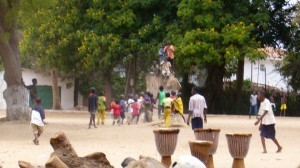 For adult drumming and dance classes, King will be teaching as part of One Africa’s Drum & Dance classes, being offered on Mondays and Wednesdays beginning 24th May 2010. Follow this link for more information. 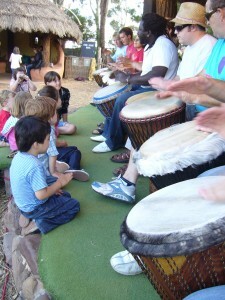 Kings highly sought after school workshop program ‘enhancing cultural awareness through music’ has been introducing children to African drumming and culture in Europe, UK, Canada and Australia for 15 years. This program caters for primary and secondary age children and can be a single or a series of workshops building to a performance piece. Learn how to make, tune and repair your own drum.